This mobile advertising book explains how to setup, send, and manage advertising programs for mobile telephones. Mobile advertising is the communication of messages or media content to one or more potential customers who use mobile devices. According to strategy analytics, the mobile advertising industry will reach $14.4 billion in 2011. In 2007, mobile advertising network AdMob.com was already delivering 1.5 billion mobile ads per month! This figure shows how a mobile advertising system can work. In this example, a company creates and submits a small banner ad to a mobile advertising network and selects location, time and category as the ad promotion criteria. The mobile advertising network submits these ads to multiple mobile networks and keeps track of the transmission, selection and response to these ads. The mobile system operators review the capabilities of the mobile devices in their network to determine which devices can receive and respond to mobile ads. 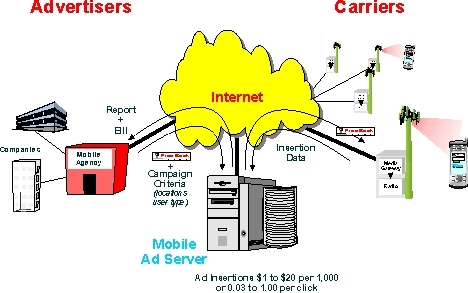 This figure shows how a mobile advertising network can operate. The mobile ad network receives and reviews mobile ads from content providers or mobile agencies along with the ad campaign name and criteria. If the ads conform to the required guidelines and are approved, the mobile ad network can forward these ads to mobile carriers that have been defined by the mobile ad campaign. The mobile carrier or their portal operators receives and delivers the ads to the appropriate channels and report the status of ad delivery to the mobile ad network. The mobile ad network uses this information to produce marketing reports to the advertiser and to calculate their mobile advertising costs. 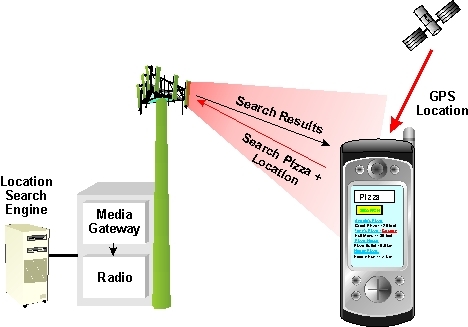 This figure shows how a location based search is the entry of the word "pizza" into a mobile telephone search engine which is combined with the location of the mobile telephone to identify Pizza restaurants that are near the mobile telephone. This example shows that some of the listings include coupons that can be used immediately at the restaurant. This book explains how to setup and manage mobile advertising marketing programs. Mobile advertising is the communication of messages or media content to one or more potential customers who use mobile devices. According to strategy analytics, the mobile advertising industry will reach $14.4 billion in 2011. In 2007, mobile advertising network AdMob.com was already delivering 1.5 billion mobile ads per month! Mobile advertising is different than other forms of media advertising. Ads can be targeted to very specific types of users, triggered to display at specific times, and have several new real-time interactive options. As a result, mobile ads have a much higher value than other types of advertising. Mobile ad click through rates of 3% to 4% are not uncommon. As with Internet advertising, many people already receive mobile ads but are unaware they have received (and may have responded to) mobile ads. Many mobile ads are small banners and/or text links that share a screen that the user has selected (such as a local movie directory). The types of mobile ads range from fairly simple text links to interactive software programs. Mobile ads have response types that range from text link clicks to launching new software applications. Mobile ad targeting can be performed by using mobile communication channel types that can include mobile communities, download sites, entertainment applications, information services, and specialty portals. The type of mobile ad and the way it operates varies based on the mobile device capabilities. These capabilities include display, media processing, limited amount of memory, and input control functionality. As a result, some guidelines have been created to help ensure the user�s experience with mobile ads is reliable and acceptable. Different types of services including short text (SMS), multimedia messages (MMS), WAP, xHTML, or packet data connections may deliver advertising messages.